In this third video in the Beginners Guide to Knitting series, I would like to show you a method of casting on that I really don’t like and seldom use. loses its original shape if subjected to stretching and movement. 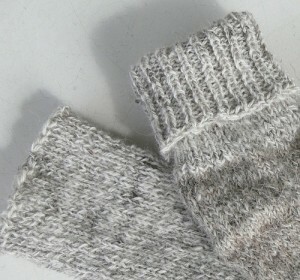 However, if you try this casting on technique, you can learn a great deal about how tension affects your knitting. In this video I show you the difference between knitting through the front leg of the stitch and the back leg. Knitting through the back leg of a stitch adds a slight twist that takes up some of the slack, whilst knitting through the front leg allows more slack in the edge. This might seem like a really basic point, but it is a point that some experienced knitters haven’t yet realised. Another element of the knitted casting on method is that it does not require a long tail. A three inch tail is quite sufficient, which means there is less chance of knitting the tail instead of the working yarn. Hands up anyone who has managed to knit to the end of the tail, before realising their mistake? My hand is firmly up there! If you’re looking for a decorative, lacy or stretchy edge for a project, then try the knitted cast on. More knitting and spinning videos coming very soon. Stay tuned!